Emmons received a BFA from Ohio Wesleyan University and a MA and MFA from the University of Iowa. He has held solo exhibitions in Boston, Chicago, Philadelphia and San Francisco, among other locations. His work has been included in group exhibitions in innovative commercial galleries, artist-run spaces, and non-profit institutions. Emmons has received numerous awards including a Fellowship in the Arts from the Independence Foundation; an Individual Creative Artist Fellowship from the Pennsylvania Arts Council; and a Fellowship at the MacDowell Colony. His work has received critical attention in The Huffington Post, Itsnicethat.com, Coolhunting.com, New American Paintings, as well as many other print publications. He is currently an Associate Professor at Tyler School of Art at Temple University in Philadelphia. 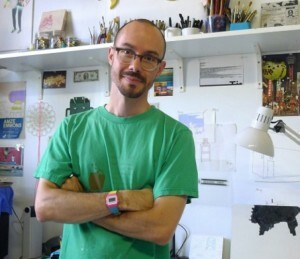 Emmons is also a co-founder and co-contributing editor of the popular art blog, Printeresting.org. Click to view Amze Emmons’ work in The Print Center Gallery Store.